The new Volkswagen Golf BlueMotion Diesel claims to return 62 MPG (US); in comparison, when measured using the same European combined cycle, the 2008 Toyota Prius gets 54 MPG. That's right: Using nothing but a thrifty diesel engine, low-rolling resistance tires, a revised gearbox and minor aerodynamic improvements, the non-hybrid diesel smacks the Prius around wholesale, making the Golf BlueMotion (blue stands for pee, by the way) a seriously impressive vehicle. But will you ever be able to buy one? Maybe. Unlike the VW Golf Twin Drive and Hybrid Diesel Golf, the BlueMotion is actually destined for production. Currently a “concept,” VW intends to offer a BlueMotion Golf for sale in Europe “around mid-2009.” We’re going to assume VW will give the Golf the misjudged Rabbit name when US sales begin some time next year, and while we don’t expect to see a Rabbit pee version sold here, the entry level 2.0-liter TDI still manages to return 52 MPG (US) in the European combined cycle. Expect it to deliver combined fuel economy figures in the low to mid 40s when certified here. 99 G/KM, 74 MPG: GOLF BLUEMOTION CONCEPT SETS NEW BENCHMARKS Volkswagen has today unveiled the remarkable Golf BlueMotion concept vehicle, a car capable of achieving a combined 74.3 mpg while emitting just 99 g/km of CO2. This matches the economy of the Polo BlueMotion, itself among the most efficient vehicles currently on sale. The BlueMotion label was first attributed to the Polo in 2006 and represents the most efficient model in each of Volkswagen’s passenger car ranges. Since the Polo made its debut, BlueMotion versions of the Golf Mk V, Golf Estate, Golf Plus, Jetta, Touran, Passat, Passat Estate and Sharan have been launched. The new Golf BlueMotion concept is powered by a highly-efficient and refined 1.6-litre TDI common rail diesel engine developing 105 PS and 184 lbs ft of torque at 2,000 rpm. Despite the focus on economy the Golf BlueMotion concept can reach 62 mph from rest in a respectable 11.3 seconds before going on to a top speed of 117 mph. As with all BlueMotion models the Golf BlueMotion adopts a series of changes to drivetrain and aerodynamics in order to maximise the vehicle’s efficiency. A set of low rolling resistance tyres are joined by optimised aerodynamics and revised ratios in the five speed gearbox. The resulting combination of changes works to reduce loading on the engine to drive up economy and reduce emissions. In common with every diesel model in the forthcoming new Golf range the BlueMotion concept is fitted with a diesel particulate filter. Even in standard non-BlueMotion form, the new Golf sets new economy standards. The entry-level diesel Golf will be powered by a 2.0-litre TDI 110 PS common rail engine capable of achieving 62 mpg on the combined cycle while emitting 119 g/km of CO2. This matches the economy of the current Golf BlueMotion model. 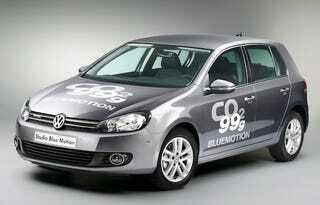 The new Golf will go on sale in the UK in January next year; the BlueMotion model will follow around mid 2009.